Husband saw me put my feet into my quillow’s* pocket and asked whatever happened to other quillow we used to have. The nights have been cold and he wanted somewhere to warm his tootsies while watching TV. I knew which one he meant, but it went missing years ago. So I asked if he’d like me to make him another one — he said no, but I thought of my Dad, who’s having his 80th birthday in a few months’ time. I have a lot of green in my stash and scrap bins and didn’t know what to do with it all. Some of the fabrics I have never liked, but they came with other fabrics so I ended up with them. 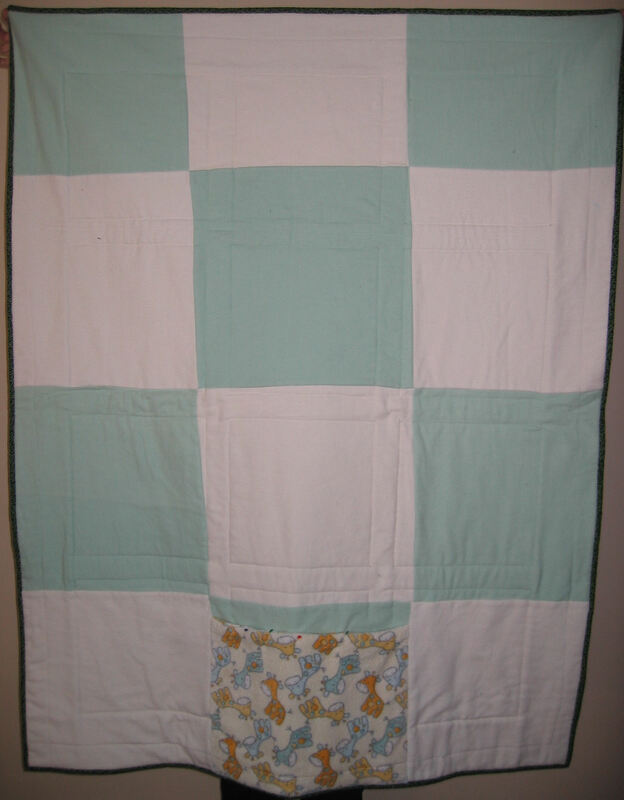 I had some baby blanket-like flannel in soft cream and soft green, and another minkie-like fabric in yellows and greens. I figured those fabrics would be nice and warm for the backing and the quillow pocket! This quilt was not made with any sort of pattern. It was me constructing things as I went — in my head, with a few scratchings on paper. I didn’t even attempt to make it a proper quillow — I just wanted a lap/body length quilt with a pocket for feet on the back! After choosing my likely fabrics, I chose several pieces that had a full width of fabric (approx 42″) in light, medium, medium-dark, and dark fabrics. These were the baselines for the wave cut fabrics. I freehand wave cut fabrics, turned over and pressed their cut edges a quarter inch, then pinned and sewed them to the baseline piece, building up each layer until I had a piece approximately 15″ high and 42″ wide in each of the colourways. I say approximately because this wave cut technique seems to grow the dimensions and I ended up with several pieces that were much longer than 42″ at the top! Each strip of 15″ x 42″ had a lighter fabrics in that colourway at the top and a darker fabrics at the bottom. Lots of pressing was involved. I cut each strip into three blocks, approximately 14″ x 14″, then fused each block onto 14″ x 14″ Pellon (I numbered the backs so that I knew which went where). 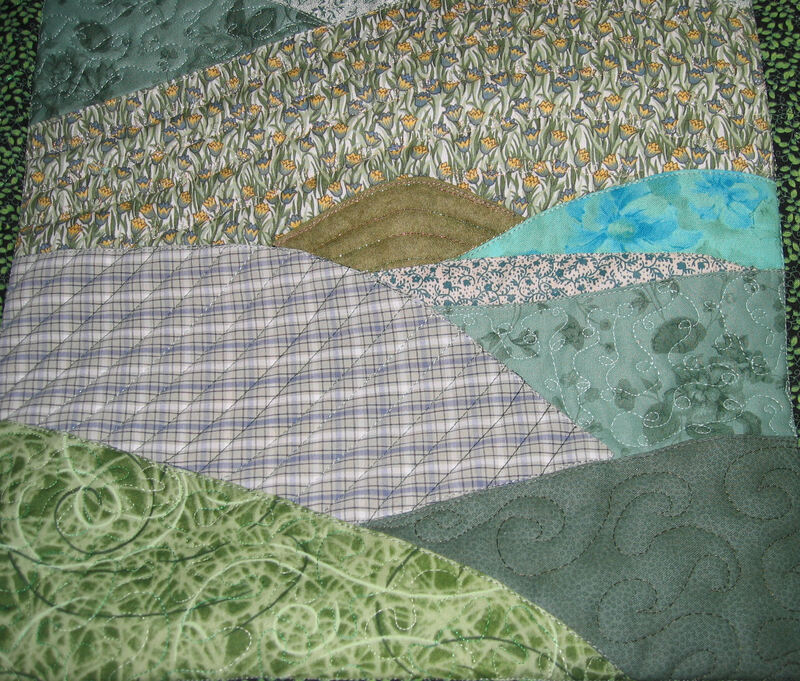 I then used free motion quilting to quilt each block. 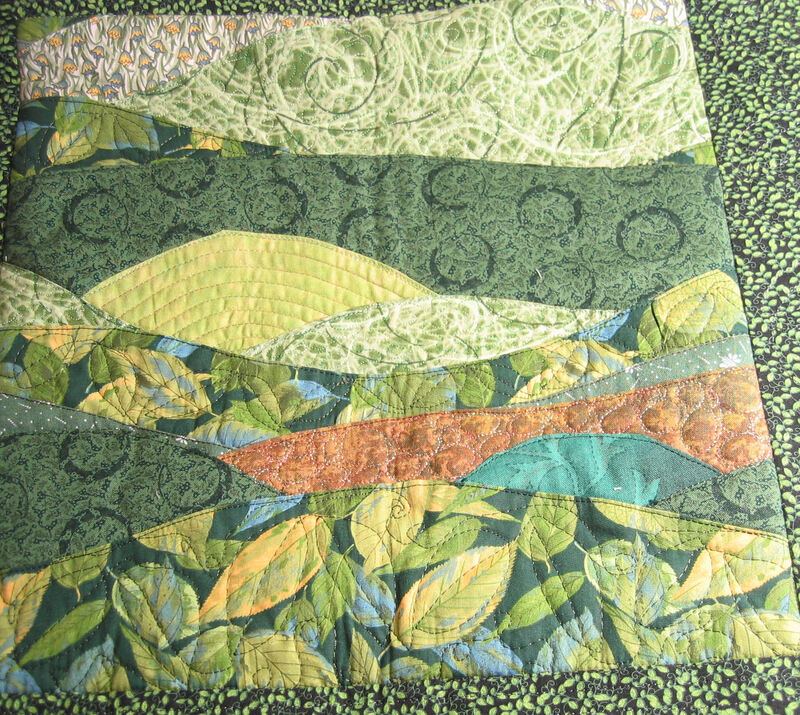 I quilted within most of the ‘hills’, leaving some unquilted so they had some puffiness, giving them a 3D quality. 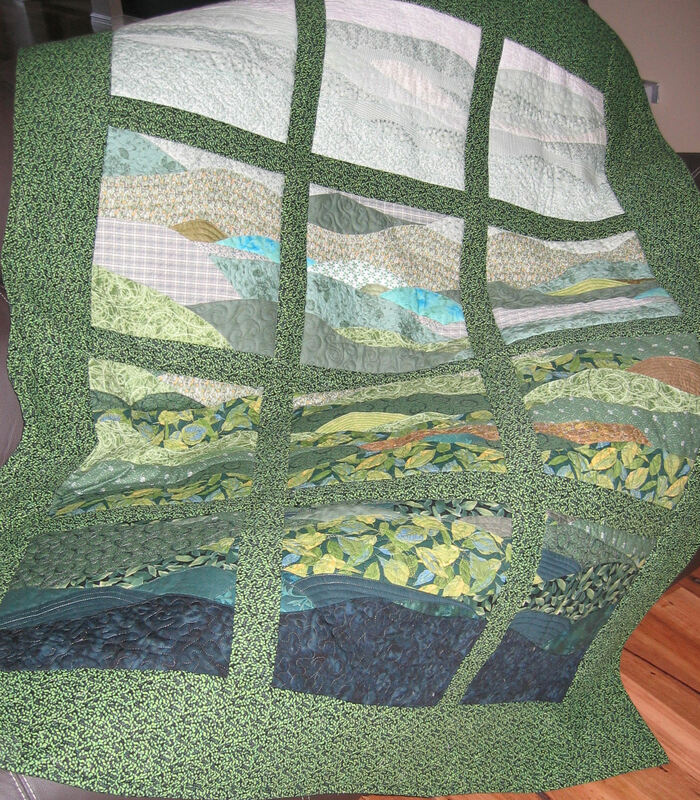 I now had 12 large quilted blocks, which I cut down and squared off to 13″ x 13″ each. Next came the sashing. 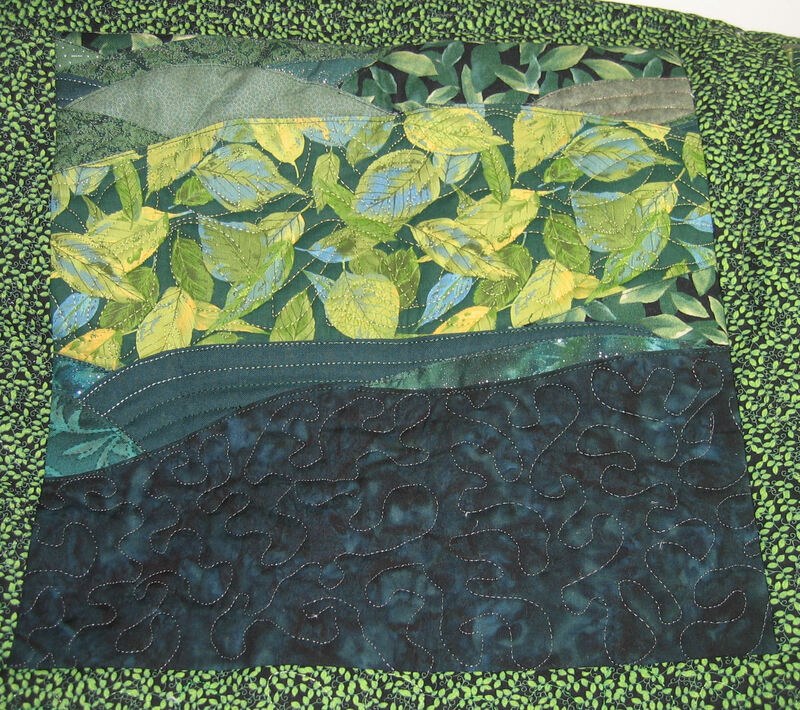 I used a matching green and black tiny leaf fabric for the sashing, the border, and the binding. Each sashing strip was 3″ wide, and the border strips were 6″ wide. I added sashing strips to the right sides of blocks 1 and 2 (of three across), then sewed each strip of blocks back together. I pressed the sashing strips, then fused thin strips (about 1.5″) of Pellon on the back of the sashing strips, then added stitching to quilt them down. 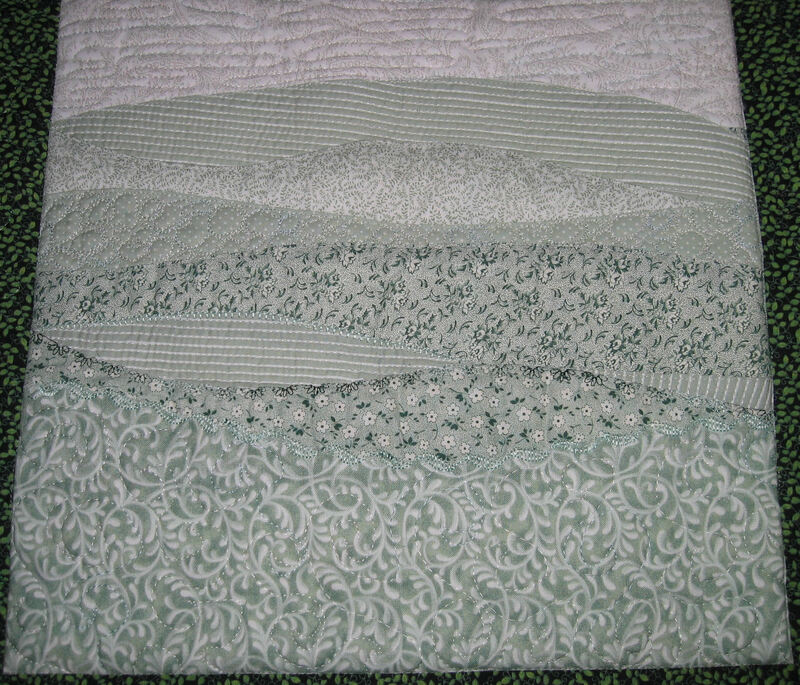 Finally, I added long sashing strips to the bottom edges of strips 1, 2 and 3 (of four), and sewed the strips together, adding Pellon and quilting these sashing strips too. Yes, this is all very unconventional! After making sure everything was still square (amazingly, it was! ), I fused 5″ strips of Pellon to the middle of the border strips (making sure I left half an inch of fabric either side of the Pellon). 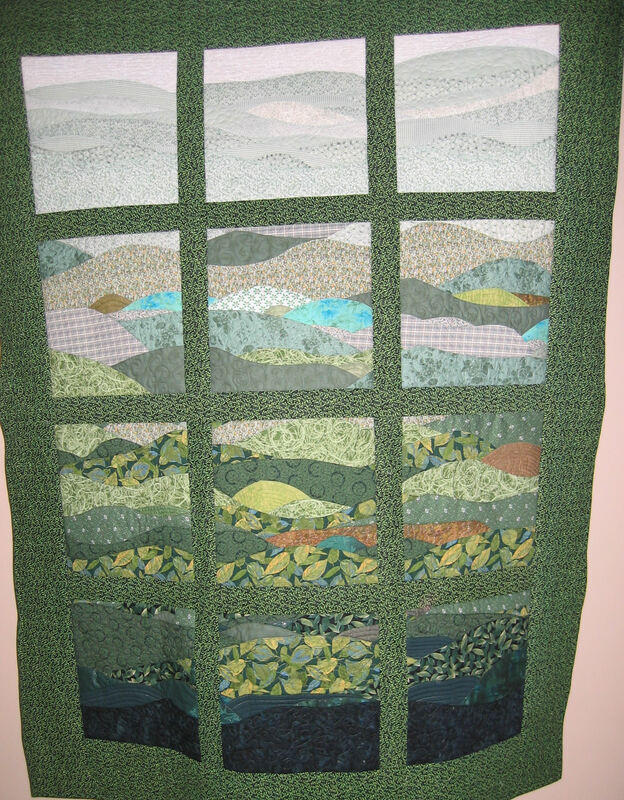 I did this quilting separately as I knew I’d have difficulty with the weight of the top to quilt the borders once I added them. I then sewed the borders to the quilt top. Next came the backing. I didn’t have enough flannel in a single colour to make a solid backing, so I cut 19″ x 19″ squares of each colour, then sewed them together to make a chequerboard effect. I didn’t sew the final row until I had created a pocket with the printed flannel and attached it to the centre block of the last row. (The pocket was simple — I just cut two 19″ squares from this patterned fabric, put them right sides together and stitched across one seam. I then turned it out and laid it over (and slightly down) on the middle block of the last row. Finally, I laid out the back, sandwiched it with batting, then laid the top over it all. I pin basted the entire quilt, then machine basted the outer edges. This quilt was really heavy by this stage and as all the feature quilting was done, I only needed to make sure all the layers were stitched together. 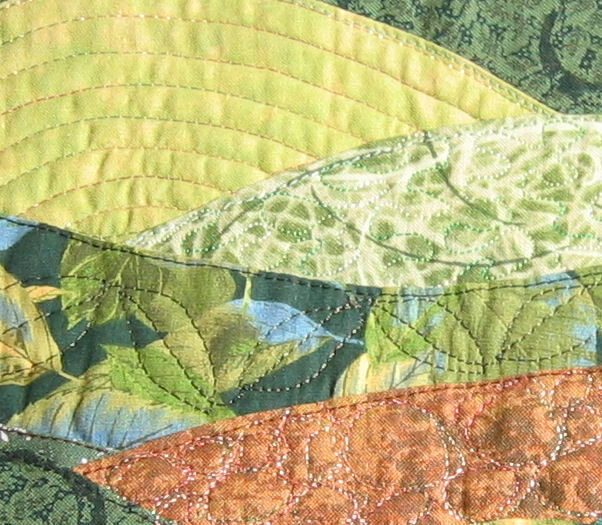 As a result, I only ditch stitched the inner edges of each quilted block. Even with that, it was still a very heavy and bulky quilt to get through the throat of my machine. 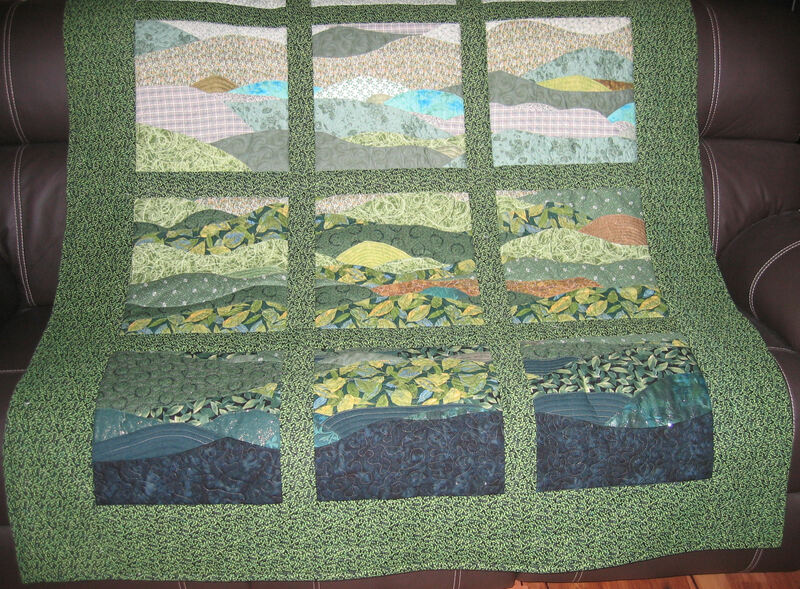 Once it was all done, I machine stitched the folded binding to the front of the quilt, then hand stitched it to the back. I reckon this quilt took 20+ hours to make. It was fiddly, but enjoyable too. And I didn’t buy a single piece of fabric or spool of thread extra — I used everything for this quilt from my existing stash! Dad loved his quilt! And my almost-30 nephew loved it too and insisted on calling it a ‘blankie’ and then said he’d like his own ‘blankie’ too — in grey! * Quillow — cross between a quilt and a pillow. It’s a quilt that can be folded into a ‘pocket’ and, once inside the pocket, the pocket becomes a cushion. That is such a gorgeous quilt! You are so talented! Wonderful.